In April 2004, French architect Anne Lacaton described in a lecture in Rotterdam her daily practice, showing pleasantly unpretentious images of the private houses the practice had built over the years. Most photographs were taken after years of inhabitation. The houses were constructed of unassuming materials such as glasshouse components, corrugated sheeting and cheap timber panels. Still they appeared remarkably ‘local’ and comfortable. According to Anne Lacaton, the 21st century is the age of the users. Contemporary architecture, she submits, is subject to demands that go beyond the image, beyond the statement, beyond the narrative concept. For Lacaton, architecture is a service, eco-friendly building an obligation and spacious living a right. To achieve these ideals both technically and financially it is necessary to accept the building industry as a partner and to master industrial and other production processes. The work on display was a perfect illustration of her thesis. The houses built by her practice are spectacularly big and spectacularly cheap – thanks to the use of sophisticated building systems developed for utilitarian applications. They have their own aesthetic, sometimes light and poetic, sometimes provocatively blunt, even ugly, and usually both. The role of the architect that is being described here is that of someone who is technically competent, socially engaged and prepared to serve. Someone whose specific expertise enables him or her to evaluate and balance the priorities of all the other factors and parties involved in a building proces, and to combine them into one aesthetic whole. In short, the architect as master builder. The attitude to the discipline of architecture described here seems to be compellingly independent of style or ideology. In fact, what Anne Lacaton is saying – or what I like to think she is saying, at any rate – is about the same as many of her European colleagues try to express, often with very different and literally much heavier means: let us rediscover architecture as a discipline. Let us concentrate on our particular expertise and use it in an intelligent manner. Let us focus on new possibilities and tasks, but from within the discipline and not from outside. And let's embrace the issue of sustainability as a central concern. That is the only way to continue to play a significant role in the present day and age. Even though I wrote this short introduction already some years ago I still fully identify with the way Anne Lacaton defines her profession (or my interpretation of it). 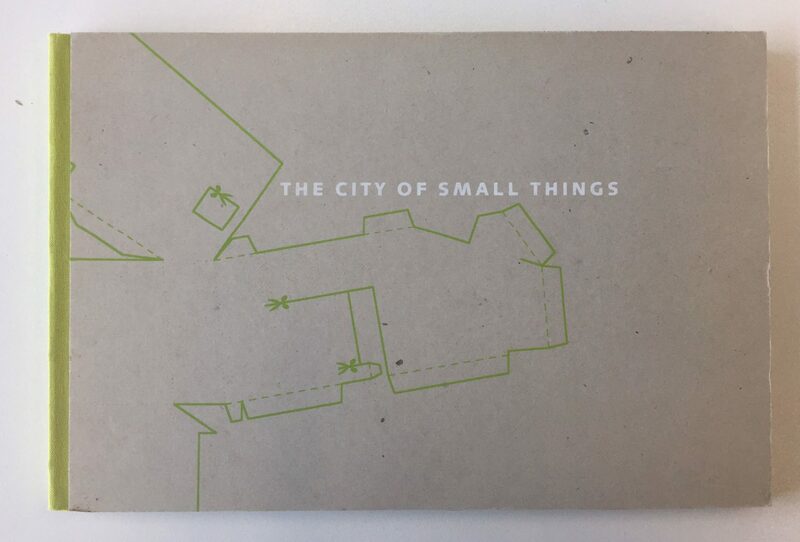 For us too sustainable thinking deals with the way we look at architecture in general, the city as a whole, at the issue of time, durability and temporality, and at cultural, social, esthetic and functional issues. In the work we do in our practice in Rotterdam- mostly relatively small-scale architectural objects- these different kinds of sustainability are an underlying concern that determine the development of our projects in general. 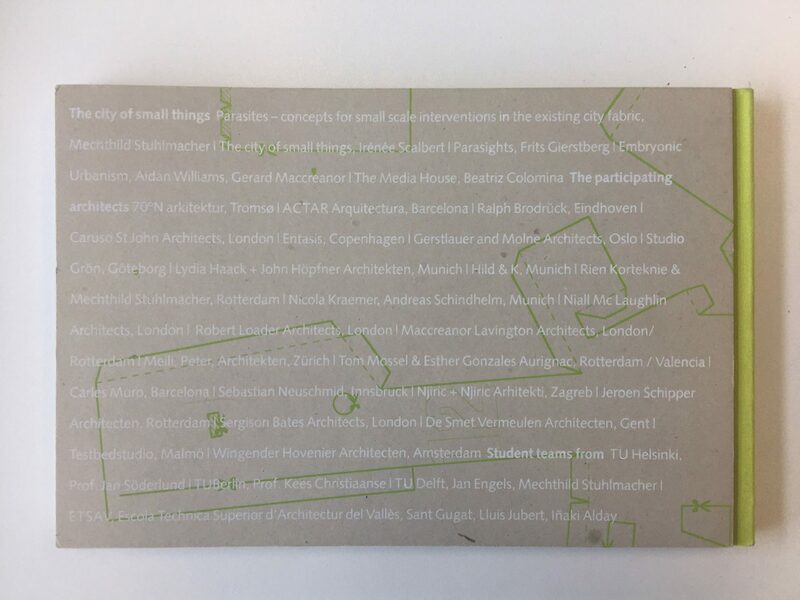 The first part of my story, 'The Parasite project' describes an exhibition project initiated and curated by us from the end of the nineties onwards dealing with the architectural aspects of city-densification, temporality and small scale. The second part deals with our interest in environmentally sound structural systems and their architectural implications. The third part describes a project for a small house for culture in The Netherlands. To us this project feels like a summary of the ideas about material and cultural sustainability we developed in the first eight years of our practice. As a result from a competition success in the context of a Swedish housing manifestation we were asked to develop a proposal for an exhibition alongside the larger event. The result of the commission was an exhibition scenario and the name ‘Parasites’: 'prototypes for advanced, ready-made, amphibious small-scale individual temporary ecological houses'. The subject of our exhibition proposal was the design and realisation of small structures for unconventional sites, involving some 30 architects and student teams from all over Europe. 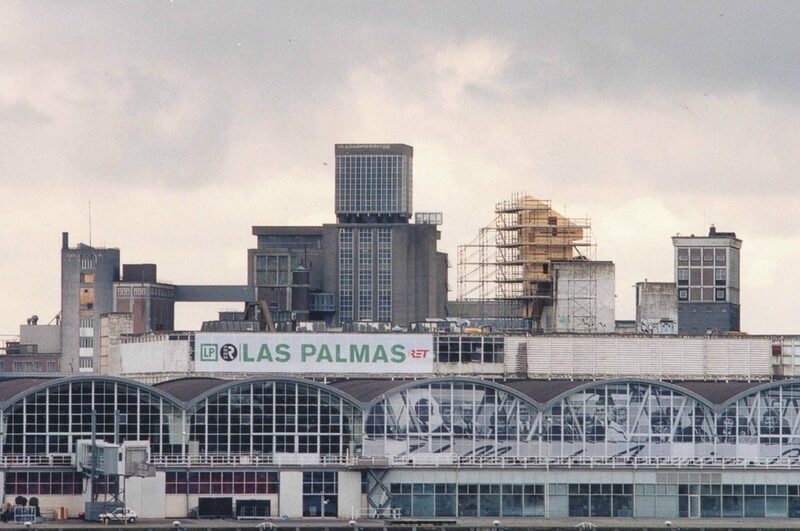 The 'Parasites' were to be prefabricated by the architects in their own country and according to their own specific manner, and reassembled on the exhibition site, and were meant to occupy temporarily available sites, unused roofs, water-surfaces, and hang or cling onto existing buildings. The way we planned to spread them out over the neighbourhood was meant to underline their slightly subversive character. The concept of the Parasite project was partly inspired by a Glenn Murcutt House for an indigenous family. The prototypical, airy, poetically simple building had made a lasting impression on us. The house showed us the architect's deep appreciation for his clients' close relationship to nature. 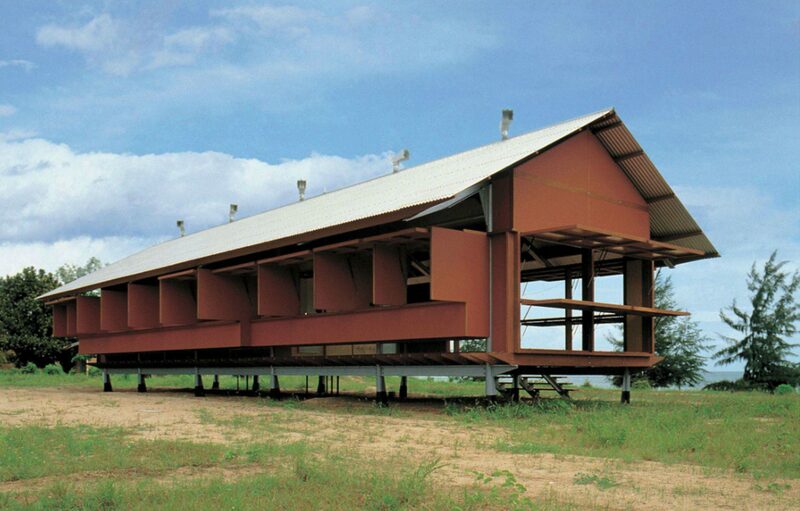 Murcutt had designed a sturdy yet ephemeral building that wouldn't leave any permanent traces in the landscape. To achieve the material quality he aimed for he organised the building work close to himself. Consequently, the complete house was prefabricated in large elements in a workshop in Sydney and assembled in a short time on site by very few people. Starting to develop ideas about the 'Parasites' we aimed at adapting similar ideas to our own, urbanised European environment, adopting the principle of prefabrication to much smaller buildings and budgets– trying to work as responsibly and carefully as Murcutt had shown us. When we thought about temporary buildings we thought about experiments. We thought about the enjoyable feeling to not be forced to make decisions for the long term, to be able to try out things, look for extremes, escape rigid building rules and take risks. And we thought about our own cities as multi-layered organisms that stay livable and lively only as long as they absorb and accommodate both the planned and unplanned, both old and new, and both the established and the exploring. Initially our exhibition-proposal was received with great enthusiasm. As a prelude to possible realisation at a later stage, we asked the participants to make a 1:20 model of their Parasite object, and used these to put together an exhibition that travelled from Scandinavia to Great Britain before arriving at its final location, Las Palmas in Rotterdam. After the sudden bankruptcy of our first Swedish host however the project changed and the Parasite exhibition was transferred to The Netherlands. 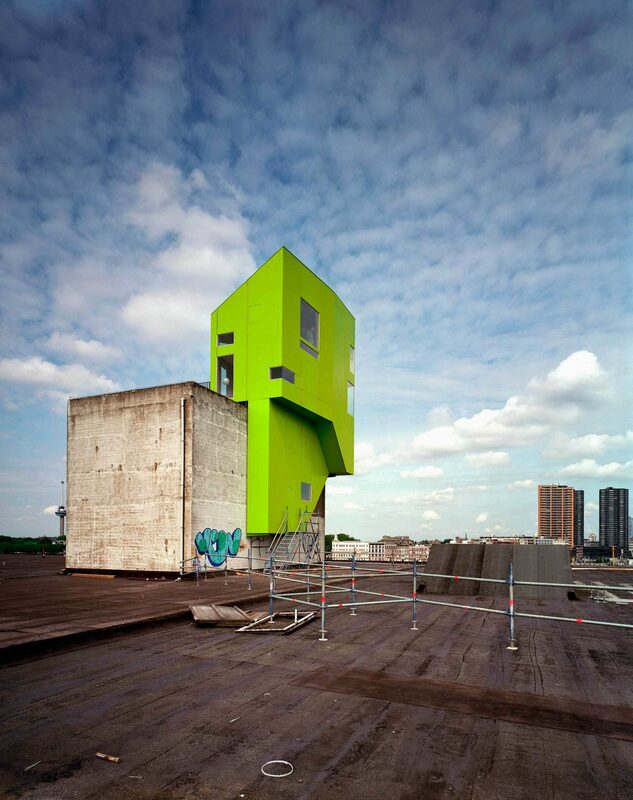 The organisers of another large-scale cultural event, the programme for the year 2001, when Rotterdam was selected to be 'Cultural Capital of Europe' embraced its idealistic aims alongside its accessibility for the general public. In Hoogvliet, a Rotterdam post-war-suburb, a gentle reanimation process had just been started, a rather complex process loosely linked to the programme of the Cultural year. It provided our initiative with a harsh but challenging venue. With their varied and optimistic appearance the Parasites were expected to contribute to the intended regeneration success of Hoogvliet. The objects would gradually be built in full scale to be used for a variety of purposes during several years of spatial restructuring. Owing to the Dutch location, the project provided us with an unexpected opportunity to react against the superficial image of the Dutch architecture of the time being generated by international magazines. Our exhibition was not about fancy objects and not about architectural virtuosity. While everyone else was talking about bigness, our concern was with the small scale. We propagated acupuncture instead of tabula rasa, the cherishing and augmenting of the existing. And while many colleagues around us were working on impressive housing blocks we were concerned about individual expression and discrete urban densification. Our reference for the desired ‘sustainable impermanence’ was not the impressive Dutch pavilion in Hanover on the World Expo 2000 everyone admired at the time, but the rough, reusable Swiss woodpiles a few streets away. Because in that remarkable ‘Klangkörper’ (Body of Sound, Swiss pavilion designed by Peter Zumthor) we could hear, feel and smell real material, and because there we could enjoy the astonishing power of a space in which it seemed that idea, form and construction were one and the same. The final Parasite designs varied enormously, ranging in character from pragmatic, poetic, dreamy, naive or even clumsy proposals to elegant or utopian constructions. One thing that struck us was that the ultimate quality of the designs depended almost exclusively on whether the material had determined the form rather than vice versa. 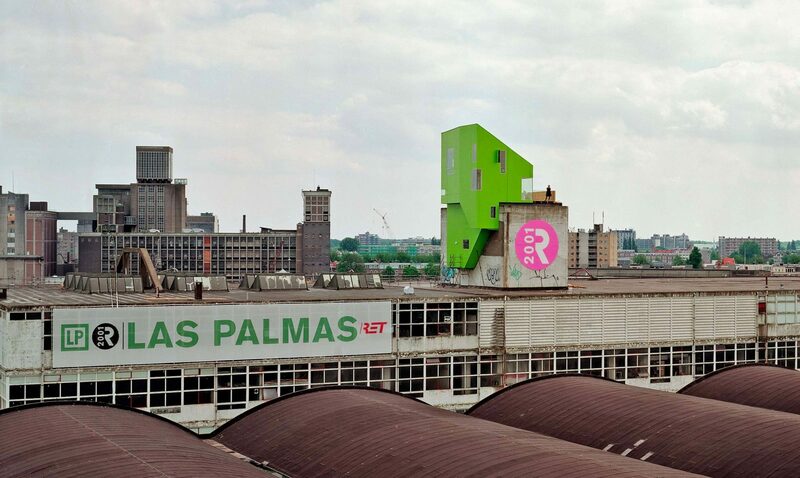 In the end, for a variety of reasons, only two of the projects designed for the exhibition were actually built: the Parasite on top of the lift-shaft of our exhibition venue, the Rotterdam workshop building Las Palmas, designed by ourselves. 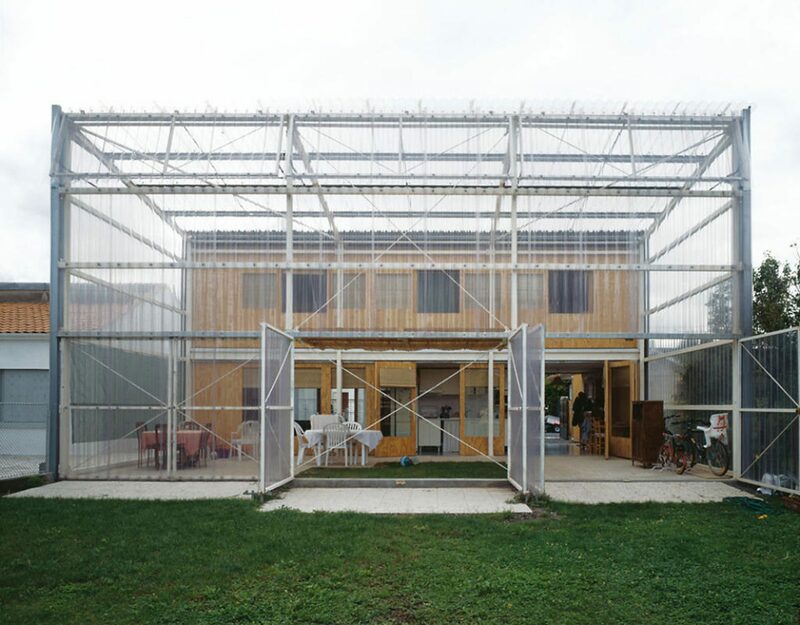 The second, designed by the Swiss firm Meili Peter Architekten did duty as a temporary community centre. 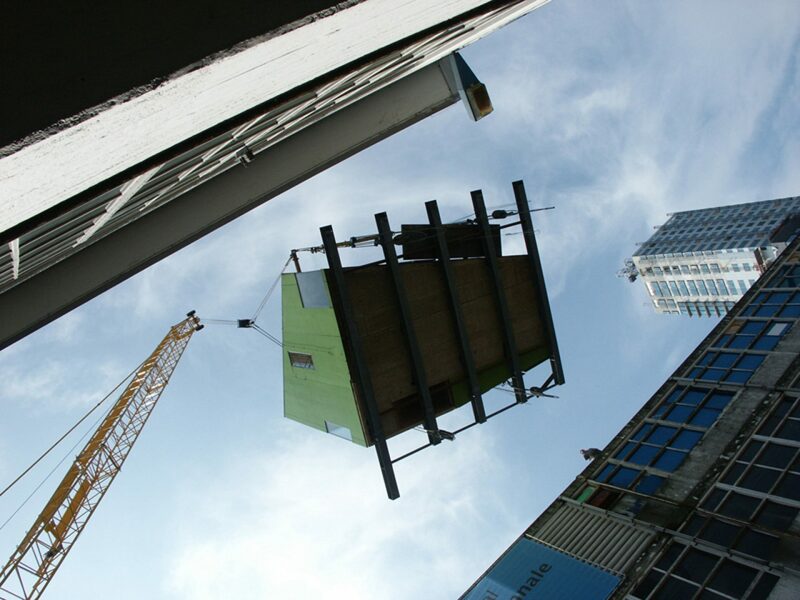 In line with our exhibition concept, the two buildings were prefabricated in specialised workshops, in Germany and Switzerland respectively, and assembled in Rotterdam. In 2004 they were joined by three School Parasites, to be used as high quality emergency classrooms adding social relevance to the architectural and technical aspects of the project, and there is every prospect that more will be built in the future. Our own little building, with its conspicuous colour and shape, was in the first place intended to act as a highly visible three-dimensional logo for the Las Palmas architecture and exhibition site. It symbolised innovative urban densification, experimental housing construction, improvised town planning and a touch of anarchy. The Parasite was constructed of solid timber panels using a wood construction system imported from Germany never previously used in the Netherlands. Walls, stairs, floors and roof were all of the same structural material. In the middle of this commercially successful development area there arose a rudimentary, completely wooden space that formed a remarkable contrast with its rapidly changing, watery-grey metropolitan surroundings. Here our primary concern was a simple solution to a structurally complex task and the consistent, almost brutal application of a sustainable construction system that we imagined capable of opening up new possibilities well fitting within the pragmatic Dutch construction culture. Solid timber construction panels have been produced since the eighties in countries with a large, natural production of indigenous softwood, such as Germany, Scandinavia, Austria and Switzerland. Looking at the long history of timber construction the development is revolutionary: for the first time a timber construction system is no longer based on the assembly of linear elements with an infill but on the assembly of solid, more or less homogenous panels. Both the idea and the technique are simple. Comparable to the production of plywood, solid timber panels are produced by laminating different layers of timber sheets crosswise on top of each other. In recent years a number of manufacturers have entered the growing and therefore highly competitive market offering slightly different products and services. The panels vary in thickness, composition, layering, structural performance, aesthetic quality, and price. There are many arguments in favour of the use of solid timber construction. It may be the need for sustainability in the literal, material sense: the desire to build exclusively with renewable resources and timber as a CO2-neutral material. Some projects enjoy its structural performance working as an undirected slab enabling generously cantilevering constructions and corner windows. Other projects require an extremely short building time, and again other projects benefit from the material's texture, colour, smell and atmospheric qualities. For the projects we worked on since we founded our office in 2001 all aspects mentioned above somehow played a role, with differing priorities each time. The really decisive arguments for us however had to do with the possibilities the material offered for spatial and architectural expression. Starting with our first building experiments we were fascinated by the stunning simplicity of the building system and the freedom for designing it offered. We also were charmed by the lively characteristics of its natural surface. To us the material was a convincing proof that industrial prefabrication doesn't necessarily limit spatial possibilities. The specific production technique of the solid timber elements doesn't require standardised dimensions or large quantities of similar elements to be efficient. The system therefore easily combines the qualities of tailor-made design with the advantages of industrialised mass-production. Dutch professional culture is largely determined by trade rather than by production and craft which applies also to the building industry. Most building projects are built by general contractors who determine (and limit) the range of technical possibilities and standards– this in contract to the practice of many other European countries. Due to many practical reasons related to this specific way of organising the building process Dutch architecture is dominated by a strict distinction between raw construction and interior (and exterior!) finishes. The raw construction itself therefore plays the role of load bearing skeleton without any spatial of material qualities of its own. In this particular context an architectural culture has been developed over the years that is largely determined by conceptual and visual concerns rather than based on the experiential qualities of materials and a tectonic language. The import of half-prefabricated building elements fits into this culture of trading, and local builders can execute the assemblage quickly and economically even without specific skills. The import of these systems enables us to incorporate the material expression of its raw construction into our architecture- and that without the requirement of traditional craftsmanship that has become unaffordable in the Netherlands and therefore feels superseded even culturally. The very first project built by our office, the Parasite Las Palmas, wouldn't have been built at all without solid timber technology- simply because of its challenging site. At the time we embarked on the project we knew the material only from publications and fairs but happily decided to take the risk of the unknown. As our exhibition project had been mainly set up to communicate our ideas about sustainability in the city to a wide audience the choice for the building material played a decisive role. The project was hoped to underline our conviction that environmental consciousness and healthy building can be translated into an architecture with a clear, outspoken, contemporary formal language and atmosphere. The structure of the Parasite was designed to generously display the specific quality of the panels as two-directional slabs, resulting in its sculpturally cantilevering appearance. The material enabled us to generously cut holes for windows wherever we felt that the spectacular views of the surrounding would be most flatteringly framed. In the interior the surface of the untreated and exposed timber with its characteristic texture determined its architectural expression. Following on from this first project we took on a second commission for a similarly small-scaled project, this time in collaboration with the Rotterdam based artists BikvanderPol. It was our task to design and build a transportable studio for artists to serve as temporary dwelling and exhibition space. Due to the uncertainty of site and context we designed a closed 'black box' with the maximum dimension that Dutch regulations allowed for transport on public roads: 4x18x3,6m. Despite the temporary character of the No19 house we aimed at designing a space that was pleasant all year round. The house should respect the privacy of its temporary inhabitants and at the same time facilitate different, and much more extravert uses. The compact plan is organised around a simple core containing all facilities such as the shower, toilet, a small store, a kitchen and a large dining table. The building can be either used as one space or subdivided into smaller rooms. The skylights give all spaces an introvert, gallery-like atmosphere. When the large shutters in the different façades are open the interior space changes completely to be used as verandah or podium. These first small projects became important to us because of the freedom the kind of commission offered supporting their experimental character. The experience we gained with the solid timber construction and the discovery of its spatial possibilities we were able to elaborate further in later projects. A rather recent project, directly inspired by the client's visit to house No 19 is the aforementioned Cultural Building De Kamers. The building is situated in Vathorst, a new suburb near Amersfoort. Vathorst is one of the many low-rise mono-functional suburbs that have been built in The Netherlands since the early nineties. These suburbs usually lack any social or cultural infrastructure of their own. De Kamers is a private project initiated by a vicar and an artist. Both regarded the pioneering years of the new suburb as a challenging social and cultural period, and saw an important task for themselves. They jointly decided to create a place for ‘sociability, inspiration and expression’ in the area, with the generous support of many sponsors and the municipality of Amersfoort. The building and its activities are meant to grow with its growing surroundings over time, to offer space for various cultural activities and events such as theatre, film, and creative education. 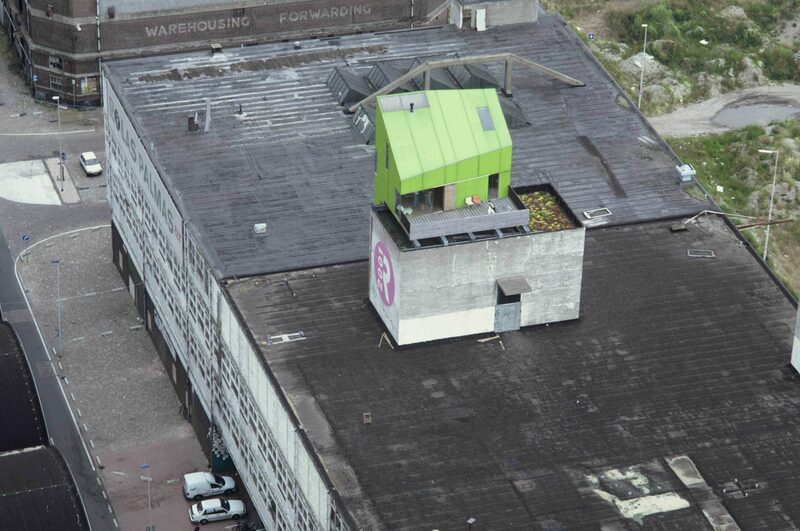 Its heart is the huiskamer, a public ‘living room', meant to be a hospitable space for everybody. The design consists of simple wooden volumes with cubic shapes and varying dimensions. These rooms are loosely put together as a casual, almost improvised composition that allows for multifunctional use and future changes. Special attention has been paid to the spatial character of each of the rooms, their proportions, materiality and use of daylight. The extremely tight budget – the building was privately funded – led to the architectural decision to give clear priority to the interior rather than to the exterior. 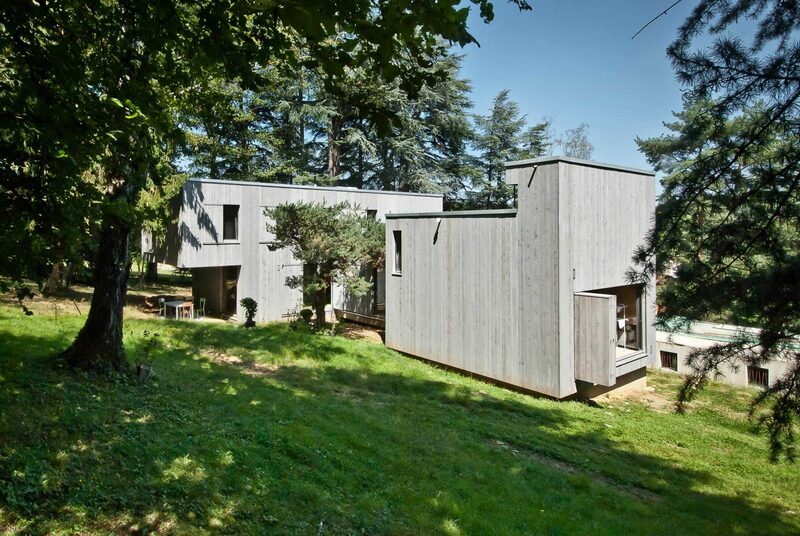 This time we made use of two different, similarly sophisticated timber-building systems. 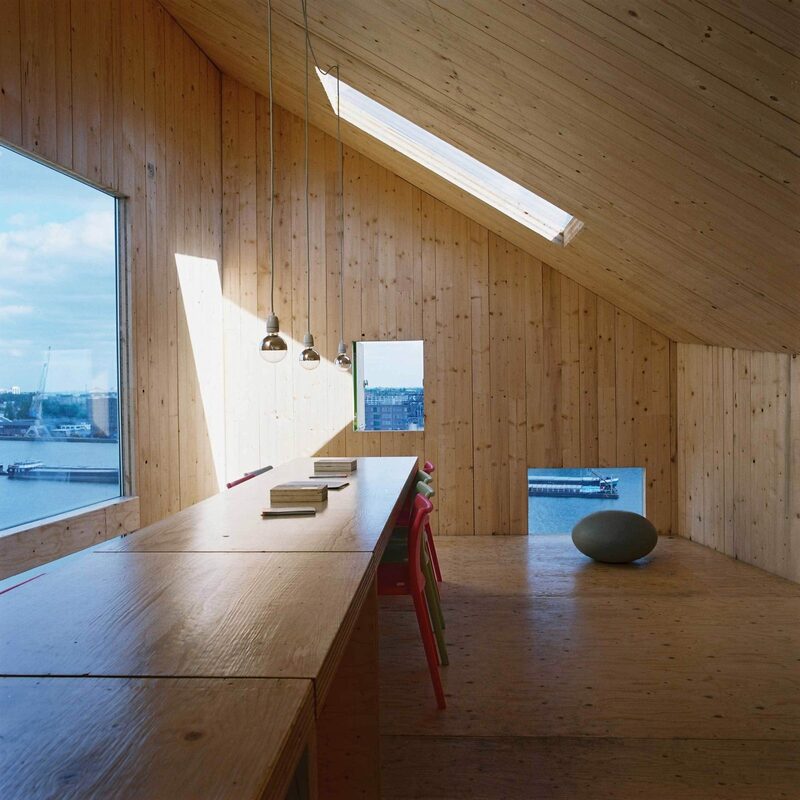 All ‘rooms’ have been constructed in timber. For the walls we used the solid timber panels; the floors and roofs however are made of timber hollow core elements we imported from Switzerland to achieve larger spans than the solid panels would allow. The prefabricated elements guarantee a clear, simple and sustainable structure with high quality finishes and good spatial and acoustic properties. The exterior is clad with stained heat-treated timber boards, a new, environmentally sound procedure to make European softwood more durable. The plinth has been designed as an advertising, ever-changing band of hand-decorated panels covered with artwork, graffiti, posters and texts made by the users of the building themselves. The composition of cubes implies the semi-enclosure of outdoor spaces. These 'garden-rooms’ are regarded as being just as important as the indoor spaces and are used as outdoor stages, gardens and terraces. Here the colourfully painted plinth turns into a wainscotting of self-made wallpaper. The large sliding doors emphasise the direct relationship between indoors and outdoors and the inviting and open character of the project as a whole. The projects and thoughts described above are just a beginning. We founded our office in 2001 when in a country like the Netherlands, more than in other European countries, the general audience still wasn't ready (and willing) to make the link between global realities and personal behaviour. Even though the lack of awareness has improved in recent times the recent economical crisis, strangely enough, has diminished the very basis of architectural culture and therefore the possibilities for our profession: after eight years of practice it seems harder than ever to find clients who are willing to take risks and truly explore the architectural possibilities of sustainable thinking. To counteract this rather frightening development we come to the conclusion that we have, despite all efforts, have failed to communicate our concerns in a way that reaches the people that matter. We feel that we now, more than ever, should concentrate on our main task –very much in keeping with the description of 'the ideal architect' of my introduction: the design of healthy, beautiful, durable and comfortable spaces. And that we should communicate about it, in a more detailed way perhaps than before, but less hermetic, less elitist maybe. Sustainable architecture is something that shouldn't reach only the cultural elite but everybody.The project De Kamers was a first important step in a promising direction as it combines our technical concerns with our cultural ambition. Furthermore it's a hospitable building many, very different people can visit and enjoy. But there is a lot more that needs to be done. The ubiquitous call and urgent need for sustainability isn't just a technical issue to solve. It's a serious cultural task that needs our full attention, despite the all-determining rules of a risk-avoiding, hesitant market.